An Old Fashioned Christmas is my portrayal of everything that is warm, cozy, sincere and authentic about family and their relationship with Christ through three generations at Christmas; focusing primarily on children, grandparents and the memories of the song’s narrator. Everyone has a role and a part to play in reinforcing a loving and nurturing family – from the pure joy of children to the dedication of loving and devoted parents, to the inclusion and warm participation of involved and loving grandparents. Of course no family is the ideal standard to emulate, and every family has its issues to deal with, as a fact and matter of life itself; but this song was my attempt to include all the best features of family and Christmas memories from a timeless perspective into a single Christmas song. The title is an interesting story in and of itself. Shortly after I had begun writing songs I answered an advertisement to, “Have your song included in an upcoming collection of songs to be called – An Old Fashioned Christmas.” The second song that I ever wrote was a Christmas song called, Sing Songs of Joy; so I wrote out the music, note for note, as carefully and perfectly as I could by hand with the lyrics – as if it was a piece of published sheet music. I mailed away the written song along with my check and waited for their response. Months later I received a single cassette tape with my song included in a compilation with other songs, and sat down to listen to it. What I heard was a singer making a half hearted and almost joking attempt to record my song along with some simple background instrumentation. I sat there after listening to my song and I had a lot of mixed emotions. As a songwriter and as an author, everything you write is personal, even if you know that some of your pieces are better than others; if a piece didn’t have some kind of meaning to you, you wouldn’t have written it. The melody on the recording was pretty much accurate – if you overlooked the part where the singer got the words all wrong and didn’t bother to do a retake – and the resulting obvious lackadaisical attitude in the studio. Regardless of the recording attempt or quality, listening to Sing Songs of Joy was the first time I had ever heard one of my own songs recorded in any version or format, and for a songwriter that is pretty special. Secondly, I could hear the potential in what “wasn’t” recorded. As I songwriter, I can mentally “hear” the song in my head in a finished format, but for me it was nearly impossible to translate that into something audible. I couldn’t sing to save my life, my piano playing was essentially self-taught and not performance quality, I didn’t know how to play the guitar or any other instruments – so the song was essentially trapped in my head unable to be expressed to the world. There was a certain amount of self-disappointment for having thrown away “good money” on what was essentially a worthless recording. I felt like a fool, having been taken by an unknown record company in Hollywood. Over time I began to start giving myself a break – how was I to know that it would be a half-hearted and lousy effort? I couldn’t have known that in advance. For all I knew these may have been serious professionals that would see something in my song, and the rest could have been “history” now – as they say when something becomes an “overnight success.” The truth is there are very few overnight success stories – and some of them end up going terribly wrong. What I learned from this experience is to dig deep, and find a way within yourself to reach your goals without thinking that someone else would hand you something on a silver platter out of the blue. I kept writing songs on our piano and started purchasing equipment over time and teaching myself how to use or play them: a simple 4 track tape deck, a Roland synthesizer, a Fender Stratocaster, an Applause 6 string acoustic guitar, an Ovation 12 string acoustic guitar, a very large Sonar drum kit (a piece at a time it seemed), a Carvin amp stack, a Carvin mixer and used Peavey PA speakers. I taught myself how to sing, play the drums and the guitar – all while moving to England from Germany, learning how to fly the F-111 – first in New Mexico and then in rural Oxfordshire, England – and continued to write songs on the piano and later on the guitar. Soon after moving to Oxfordshire I began making simple DAT (Digital Audio Tape) cassette recordings at a local recording studio, which was an in-home studio set-up in what was essentially a converted spare bedroom and closet. Eventually I stopped writing music until I figured out what to do with the 200+ songs that I had written – and as you see I’m still working through that process. It was a pragmatic decision because life was just too “full” and there were too many unfinished projects and loose ends to continue adding more to the mix. Everything cost money over time and served a purpose – to find within myself the ability to express my music. When I retired from the Air Force our family moved to New Hampshire. I played my guitar and sang at a number of open mic sessions at a local hole-in-the-wall bar, playing a whole range of songs – including religious pieces. I realized that the performing life was not ever going to be mine from that experience – as I can’t memorize song titles, music or lyrics – and have to read them off of a music stand. I got pretty comfortable actually playing my songs, and actually enjoyed the experience though. The place was never really that crowded, and folks were spread out at the bar, sitting at tables and playing pool – in various stages of talking, drinking, eating and listening. The apex of my entire open mic “performing career” as it was, came one night when I had finished playing my set and packed my guitar away in its case; I walked past a table and a young woman said, “You’re awesome.” That one little phrase, from that one person, in that one moment in time – really made my day. My performing went into “retirement” shortly after the time her comment was made, as our family moved west; and after six years of storing everything in a basement and then later in a garage, I gave all of that music equipment to a young aspiring musician with tremendous talent who is now in USAF pilot training. I sold our little upright piano, and the only thing I kept is the 12 string Ovation guitar that someday I’ll pull out from under the bed and get acquainted with again. All things have a purpose and a season, and happen for a reason. Now I’m writing this blog and who knows what I’ll be doing two or five years from now. So now we come full circle and back to An Old Fashioned Christmas. 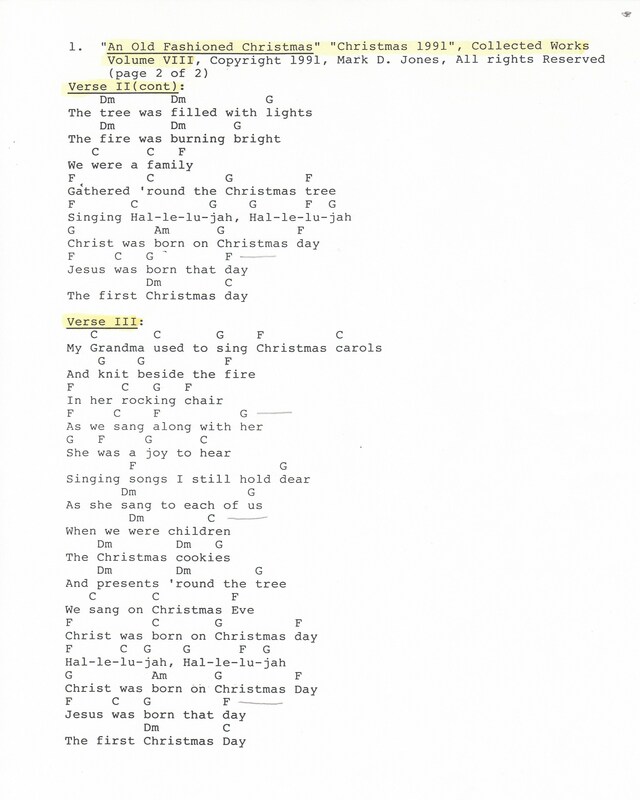 After the disappointment with the “professional” recording of Sing Songs of Joy, I began to think, “Well what did you expect, Mark?” These people in Hollywood probably don’t know who Jesus really is, so how could they actually “understand” what an old fashioned Christmas was really about? They didn’t have any “understanding” of Christmas or Jesus or the reason for His birth. 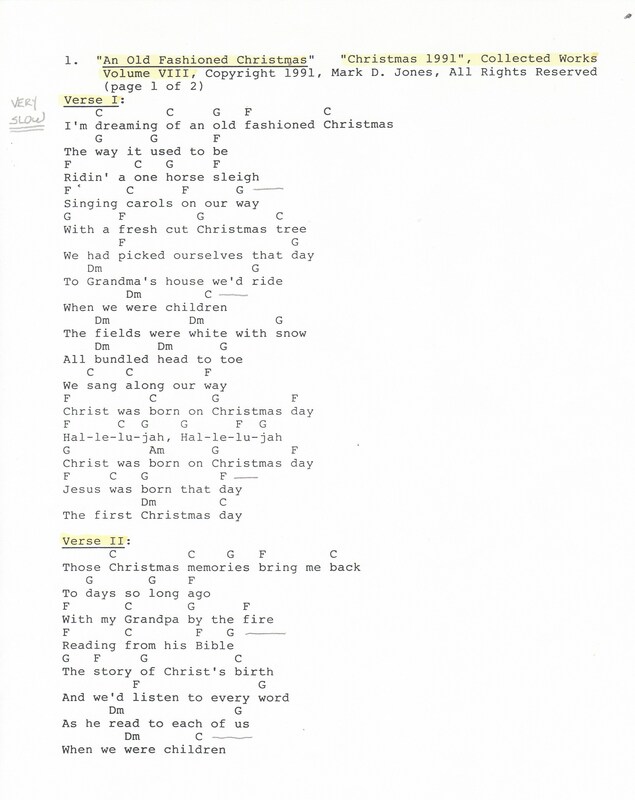 So I sat down to write a song with the real message of Christmas – one of many that were to follow. This entry was tagged Christianity, Christmas Songs, Human Condition, Life, Love, Mark D. Jones, Original Songs, Society, Songwriting. Bookmark the permalink.